The club was founded in 1954 by John Bradley who was the area organiser for the central Council for physical recreation. The first site was on a narrow strip of land on the North bank of the Thames at Lucas farm Caversham. In those days the custom was to build your own boat since ready built dinghies were few and far between. This is exemplified by the club’s object in the constitution which states “To encourage the building, sailing and racing of sailing dinghies”. The clubs chosen boat was the Heron, designed by Jack Holt. She was a general purpose gaff rigged 11 foot 3 inch dinghy which weighed 150lbs and was considered car toppable thus avoiding the need for a trailer. Little is known about the sailing activities in the first two years but Ken Grafton who joined the club in the spring of 1956 believes there was little organised sailing and probably no actual racing until 1956 when six races were held down river on the dreadnought reach. In those days the club was small with only a handful of boats, Ken’s Heron was the eighth. Sailing was social with members meeting and often, because of the absence of a breeze at Lucas farm, the fleet would drift down with the current and sail on the dreadnought reach. Returning almost always involved some rowing. The pressure from potential new members plus the poor sailing water resulted in a move in 1958 to Mill Island. This move was also organised by John Bradley who became the clubs second commodore in 1955 following on from Richard Baker. The move to Mill Island proved very popular and membership mushroomed despite the limitations of the sailing water. In a very short period of time two launching sites were built, a clubhouse acquired and erected, and rescue boats organised so that racing could take place at weekends. New boats started to appear with the Enterprise proving more suitable to the fickle winds of the river and performance much superior to the Heron. For those with crewing difficulties the solo seemed ideal and for those new to sailing the Mirror dinghy proved popular. Thus by the early sixties these three classes wee numerically strong and became the clubs adopted classes. Under the leadership of Alan Denton and then Ken Grafton membership in the sixties soon rose to over 200 where upon a waiting list was introduced to avoid straining the clubs limited resources. This was not a deterrent to the really keen sailor as the club had an annual turnover of twenty to twenty-five per cent and consequently it meant a wait of, at most, only a few months. With three adopted classes, racing was well supported and, at times, such were the numbers wishing a cup of tea the clubhouse resembled the base of a very large scrum with the ladies doing remarkably well in coaxing the urn to satisfy the often damp masses. While being a delightful site, the island did have its drawbacks not least being the problem of sailing to and from the sailing water. This involved negotiating the Mill race to port and the weir overflow to starboard with or without wind which, when it blew strongly, involved tacking every ten seconds and was further complicated in the early spring and late autumn by a strong stream. I know of two boats which were swept over the weir, one being completely destroyed. Fortunately no damage was sustained by either crew other than to their pride and pocket. One spring I also found myself in trouble when the wind dropped and my Mirror was swept towards the weir at a very fast rate. More by good fortune than skill I capsized and managed to struggle up onto the concrete pathway leaving the mirror jammed and held by mast and gunwale. I was rescued by the lock-keeper who having seem my plight, brought his boat gingerly across the current well upstream and towed me off. Having successfully arrived at the start, most races involved a tack up river to a buoy just below the first upstream island with a run back to another buoy opposite our present clubhouse. In light conditions, some of us never even saw the first buoy due to an old Oak tree on the North bank. It was most aggravating to watch Ken Grafton sweep across the river glide up past the tree and disappear while we tacked up and down going nowhere. In stronger winds, the furthest buoy was moored up on dreadnought reach beyond the island. This gave a very exciting beat between the island and the southern shore and an equally exciting run back. The trees affected the wind substantially in that, one moment you could be motionless and the next you could be planning. Dave Murrell, when Solo fleet captain was caught by such a gust; he planed across the river and up a tree with the boats bows well clear of the water! As a result “Help” was painted on the boats bottom. Open meetings were held for the three classes. These meetings were very popular, especially the Mirror one, when upwards of 30 boats would turn up. In order the cope, these races were held on the dreadnought reach using a floating platform borrowed from the university to aid with the launching of visitors boats. Boats were split into four fleets with each fleet sailing in turn against each other. Other hazards of river sailing were the fisherman and power boats. The former could not understand why sailing dinghies needed the whole of the river when going upwind while the latter reacted, when faced with a bunch of sailing dinghies, either by opening throttle and ploughing through the middle regardless or they attempted to anticipate where the boats would be and positioned their boat accordingly. This rarely worked and in the end most shut their throttles leaving the dinghies to get past as best they could. What ever the rights and wrongs there was plenty of aggravation and it was obvious to all that the three did not mix. A further hazard for the O.O.D. was the Swan. During the nesting season a Cobb would attack the rescue boats by flying straight at the stern of the boat and only at the last moment swerving off to land spluttering beside the boat, arching his neck and moving his wings in a most threatening manner. Newcomers to O.O.D. duties were terrified by this performance but fortunately the swan showed little interest when dinghies sailed past. All in all, it was time for the club to look for another venue. 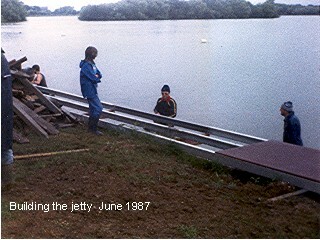 In 1967 an excited Peter Holland reported to the club he had finally persuaded John Folley and the ski club into allowing the club to use the adjacent gravel pit for winter sailing (as an experiment) and, provided planning permission could be obtained, the resiting of the clubhouse on the bank of the Thames where families could watch the summer racing. That autumn a boat site was prepared on the east bank just before the lakes outlet. This was necessary as the electricity wires were a lot lower that they are today. More of this anon. To aid launching large baulks of timber were lashed together and laid over the bank so that there ends floated. The rescue boat and those few dinghies wishing to sail were transported around by road and some racing commenced on Sunday mornings in November up to Christmas with fun sailing on Saturday afternoons. Following the initial trial in ’67 winter sailing really took off in ’68 using the ski clubs premises. Many more club members availed themselves of the opportunity to sail on unrestricted waters. Also, racing was organised for the Frostbite trophy, presented by John Folley and this attracted many visitors including the university. They were all given temporary membership for a small fee. Thus the home fleet was joined by such boats as a 505, Kestral, Fireball, Merlin-Rocket, International 14, Leader and the university Larks. For those of us that had learnt to sail on the river off-wind sailing was a new experience and the position of the boom relative to the wind took a lot of learning. In those days the far side of the lake had still to be dug out which meant courses could only be laid this side of what were the islands. To increase the length of courses water to the north of what was Cormorant Island was used. While shallow it was possible, provided the wind was in the right direction, to incorporate a run right down the north bank. As the weather deteriorated wet suits became essential, in fact, the committee were quick to realise the dangers of frostbiting and ruled wet suits compulsory for all sailing after Christmas. In those days ready made suits were rare and expensive. However, several firms offered kits comprising a roll of 4mm unlined neoprene, tape, glue, a zip, and a set of paper templates. Wives and girlfriends were inveigled into the complexities of cutting, butting and taping the garments together. If a mistake was made a gusset was easily let in. The problem was they were anything but comfortable and the seams tended to come apart and had to be dried and re-glued regularly, but they did work. Having obtained planning consent, the clubhouse was dismantled and rebuilt on its present site in the spring of ’69. Today this is the smaller of the two club buildings. The job of moving the clubhouse was masterminded by Ian Pembroke who lent us a lorry and two of his workmen for the best part of a week provided we paid their wages. The floor and the roof had to be cut into half to go on the lorry which meant besides new foundations a completely new roof covering. All agreed it was money well spent. That spring, river racing was postponed to allow working parties to build a river slip, a fuel bunker and finish off refurbishing the club’s hut. Also, Dave Murrell and others busied themselves with converting part of the old boathouse into toilets and changing rooms. The problem of drinking water was resolved by a member, who lived in the riverside cottage, allowing us to use his tap. This worked well provided the O.O.D. or his helper remembered to pick it up! During the second season of winter sailing two boats touched the overhead power lines while being man handled ashore. The first caused severe burns to Peter Holland’s daughter, while in the second incident; the power cable was actually brought down and while the electricity was automatically cut off it was almost immediately reactivated resulting in a writhing, sparking, live cable which fortunately didn’t touch anyone. Following these incidents, the Southern electricity board tried to revoke our planning permission. After lengthy correspondence involving Oxford C.C. and the board, they agreed to raise the power cables which they did in time for the following winter’s sailing. Once the cables were raised it became possible to build the lake slipway. Diggers, organised by Dave Murrell, were used to excavate the site with the spoil being spread on the ground adjacent to the cut. A coffer dam was constructed and concrete supplied by Folley (part loads) on the understanding members spread it and tamped it. This became a Friday evening job for those who could get there as soon after 5pm as possible. It was very muddy work and Lorries got stuck quite regularly and had to be pulled out! Once completed this was followed by the construction of a jetty. Some people did not sail a great deal that year! However, by the early spring of ’71 the site was quite presentable, thanks to the very hard work of a few, very dedicated members, which was just as well, since the club had undertaken to run open meetings on the whole lake for Enterprises and Solos. These proved a success and visitors were very complimentary. Meanwhile, continuous gravel extraction meant that the lake was gradually increasing in size to the point when it became possible for summer sailing. This occurred in 1970. From then on the club became very active, dinner dances were organised, barbeques held, practice races run which encourages class racing and some members, in all three classes became sufficiently proficient to be successful sailing on the circuit. This rush of enthusiasm encouraged new members which resulted in the club being able to suspend those few members who failed to undertake their O.O.D. duties! By 1974 there were 200 members, the maximum decided on by the committee, and they sailed 196 boats. There were 74 mirrors, 72 Enterprises, 33 Solos and 17 others including George Finney’s Laser (described by one member, still active, as a plastic soap dish). The general consensus was they would never catch on! With so many new members communication was becoming a problem. Mike Comber, club secretary, produced several short news sheets and John Petty, Mirror captain, quarterly notes specifically for the Mirror fleet (on pink paper). The former was concerned with galley duties, boat park, dates of cup races etc. while the latter covered such items as waterproofing the bow compartment to rigging for speed. Apart from the last two years, the 70’s saw the club continue to flourish with membership increasing, more events in the sailing calendar, an active social scene, improved facilities and the emergence of some excellent young helms following the training sessions run by fleet captains. Brian Absolom had taken over from Robin Kitcher as commodore with Ray West as V.C. He and son Jim, with several helpers proceeded to rebuild the boathouse into a most acceptable clubhouse. Once done they turned their attentions to the jetties, and because the club has suffered thefts and pilfering built a secure hut on one of the islands for club equipment. Ray headed a social committee who organised barn dances, skittles, Barbeques, a disco, bonfire with free firework display (Barry Rolfe O.C.) and the dinner/dance and prize giving. George Finney, Sailing secretary computerised the results and we even had individual handicap numbers. The best supported series was the Frostbite with, in 74/75, 79 helms participating including a handful of winter visitors. A few people began to sail on Saturday afternoons and as this became popular a second winter series evolved. The same thing happened on Wednesday evenings in the summer when the Gillette series was established (’75) by Jerry Rowlands as a friendly gathering well suited to those new to racing. This series was to prove popular with up to 40 boats participating. Class racing for all four adopted classes continued to be run on both Saturday and Sunday afternoons. However, both the Solo and newly formed Laser fleet found difficulty in supporting this level of activity and the Solos decided to concentrate on Sundays. About this time non class boats asked for a summer handicap race and as a result Sunday morning handicap racing was started which enabled several of the keener helms to compete in both the Sunday series. The club continued to run open meetings in March, using both the summer and ski club water, for Enterprises, Lasers and Solos with members from a class not racing acting as O.O.D. and helpers. Support from other clubs continued to grow but they could not match the Mirrors who hold the club record of 47 boats, (27 visitors and 20 from the club) despite sailing on the restricted summer water. The fleet had to be divided into three. However, as our summer water grew this no longer became necessary and I well remember one year Peter Holland sending us off in light and fickle airs on a beat which turned into a run and resulted in carnage as 40 odd boats tried to round the first mark. I think we all enjoyed running and sailing in these events despite the considerable effort involved. It was great to witness the skills of these top helms mastering the tricky conditions often found on our lake. On one particular windy day, prior to the start the complete Enterprise fleet were sheltering in the lee of the long island. Just before the gun they all emerged making for the start which happened to coincide with a particularly strong gust where upon they all capsized. It was quite a spectacle. With more water available, improved facilities and ample car parking space for both boats and cars the committee raised the membership limit from 200 to 250. The resulting influx of new members, especially those with Mirrors called for a substantial training input. While we set off to encourage owners of Mirrors and others to race we found that for many we had first of all to teach them to sail. Each spring owners and their families were shown how to rig, to sail, simple right of way rules and for some how to race. This was done on a set day over a four week period although we also tried a solid week of evenings. Tuesday evenings seemed to be preferred and as more youngsters appeared and became proficient in boat handling they were introduced to racing. Jose Cisneros was the mainspring in this effort. He also took training a stage further by introducing fitness training. The results were two fold. Other classes benefited as the Mirror fleet became the feeder fleet. When the family had learnt dad moved to a single hander leaving the kids in the Mirror or they sold the Mirror and brought an Enterprise. Also, many of the youngsters developed skills which surpassed their parents and their teachers and started to win club races and even open meetings. Steven Gower and Jim Absolom were the first to do well in the Solos and latterly Lasers. They were followed by the likes of Jamie Leeming, Jeremy Morgan, Philip Sheffield, Hector Cisneros, Simon Corper, Kevin Hastings, and Billy Loy and towards the end of the decade Robin and Susan Graham. However, over this period we did have some problems. On the sailing front weed and shallows proved a confounded nuisance and obtaining volunteers to man the galley was a constant source of irritation especially to non-sailing wives. Also from time to time a few boats would cross the rope and feel the wrath of our water skiing friends resulting in a letter to the commodore from Brian Savage, their chairman. The shallows were attacked by Jamie Leeming using a digger perilously balanced on a raft built by his father and by surreptitiously raising the water level by damming the outflow. The weeds were cut using a wire strung between two rescue boats and by the careful use of weed killer on the advice of the W.W.R.O. Despite these valiant attempts, over the years, weed and shallows have remained an issue. In 1979 the club lost a substantial number of its better helms, attracted away by the arguably superior facilities of Burghfield. While this caused a slight hiccup in membership it was soon made up by new members as sailing was still a popular pastime. It also allowed other a chance to walk off with the silverware. In this year Gordon Leeming took over as commodore and tried to organise a new clubhouse complete with bar to be sited west of the slipway. This was thwarted by the club’s inability to obtain a long lease from Folley. Also not all members were enthusiastic over the proposed development preferring to continue with a D.I.Y. type of club. This year was also notable for the start of the off shore sailing organised so successfully by Bill and Maggie Davis. Over this period pit talk continued as the clubs mouthpiece under the direction of Ray West, Harold Burton, and then Roy Hastings. Humorous drawings started to appear along with sketches of birds seen on the lake. However towards the end of the 80’s the club suffered a decline and this is best illustrated by quoting from Roy’s editorial on “some thoughts on the decline of RSC.” In the January edition 1986 “anyone who scans the results sheet, and indeed who turns up for a days racing, cannot fail to notice the steady decline in enthusiasm over the last few years compared to the exciting days of the 70’s when every weekend saw the lake resplendent in red, blue and white sails. We used to have a strong Mirror fleet and when considers that many of the top helms at RSC learnt their skills in Mirrors before making their mark in other classes. I forecast, when Mirror captain some six years ago, that if ever the Mirror fleet collapsed it would lead to the ultimate decline of the other fleets. The strength of a club like ours is not in the amount of funds we have in the bank, or the subscription we charge. It lies in the enthusiasm and keenness of its members to participate fully in all aspects of club activities, both on and off the water. It’s up to you! This takes us up to the end of the 80’s and completes Brian’s history of the club up to that point. The remainder of the history is told by Clive and Michael Evans. We joined the club in 1990 with a Scorpion dinghy we had previously sailed on day tickets at Black swan sailing club. Although I’m told numbers racing at the time were down on previous years the average turnout seemed to be around 30 boats of which around 10 were Lasers, 10 Enterprises and the remainder mainly Solo’s and Mirrors. Even at this time the club had 4 class starts on a Sunday morning, the remaining classes only permitted to race in the afternoons. Our first attempt at racing was a light wind Gillette in May time. Around 25 entered, Jerry Rowland won and we were recorded as ‘Did not finish’ because we were unable to cross the finish line within half an hour of him! Our second year of membership proved to be one of the most turbulent in the clubs history. In 1991 the then committee voted to abolish Sunday class starts for the Enterprise, Solo and Mirror fleets in favour of a Laser/Handicap system. This caused outrage among the racing fraternity who valued class racing as the lifeblood of the club. Many of the Enterprise fleet chose to leave the club and move to Burghfield where fleet racing was offered. This drastically reduced the numbers racing and club membership dropped to around 140. In 1992 Terry Houghton was elected as the clubs new commodore. Terry, together with Mike Vosser, Julian Horner, Ray West and Jonathan Clay set about improving the clubs facilities. At that time the clubhouse extended to the end of the current patio area and even the boathouse doors remained. Security was completely absent, the only locks secured the engines in a safe and the keys to this were kept up on a rafter ‘out of sight’. The main improvements made in 1992/1993 were the building of block walls and a strong room to improve security and flood protection, the completion of the showers, installation of a pump to supply fresh water from a bore hole and much needed internal decoration. As part of this work the clubhouse was shortened by 10 feet and a patio built. The road was also continually maintained using lorry loads of tarmac road scrapings ferried to the pot holes by Julian and Mike’s trailers. The improved facilities and access road had the desired effect. A number of members who had left the club as they took a break from the sport returned and numbers racing swelled to around 20 by about 1994/95. At this time the most popular class by far was the Laser class with up to 15 turning out some weeks in the summer. Racing was competitive with Ken Pope, Jonathan Clay, Chris Goswell, Mike Evans and Bill/Robin Graham regular winners. The Enterprise fleet had mounted some sort of recovery from 1991 with 6 or 7 regularly racing. The Solo and Mirror fleets were next to non-existent, although some keen racers Bill Loy, Andy Champ and Bernard Thompson still raced these boats. 1997 saw another small slump in numbers as racers became frustrated with the lack of class racing at Reading sailing club. The class which suffered the most was the Lasers, numbers falling from around 40 in the club in 1993 to around 20 in 1997. 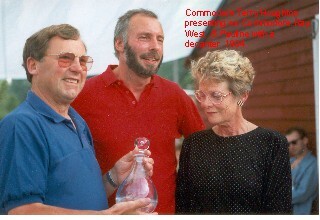 At this time a new commodore was elected in Peter Rose. A bit of stability was what was required at this stage, and a way to encourage new members. Training was provided, initially by Chris Goswell and Clive Evans, as a way for those new to the sport to learn and look towards buying their own boat. This proved a success and several new boats began to appear. Racing was still quite intimidating however and many of these members chose to steer clear of Sunday mornings. A vibrant cruising fleet often saw 20 boats sailing on summer afternoons, but an apparent divide between the two sections was often evident. It was in around 2000 that the club really put the focus of all its efforts towards the training of new members managed by Jeremy Bell. The numbers being trained each year grew to around 15, resulting in around 10 new active members a year. It is for this reason that racing turnouts have increased once more to around 20 and some form of fleet racing has developed, all be it as part of a larger handicap fleet. The club really does have a family feel about it once again, but one still can’t help thinking how nice it would be to see a return of class racing. In 2002 the club signed a 30 year lease with Lafarge aggregates for the use of the lake and plot of land. This probably represents the most important event in the clubs history since Peter Holland moved the club to the lake back in 1967. A long lease and the sports council have allowed the club to build a new clubhouse, which will be finished in 2004. I believe that despite an apparent reduction in those choosing sailing as a pastime, Reading sailing club can continue to grow with improved water; facilities; and most importantly RYA approved training.